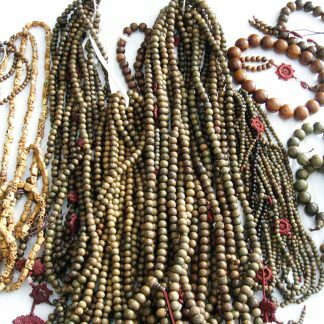 The type of prayer bead now known as Dzi (Tibetan, pronounced ‘zee’, alternative spelling: gzi) is a type of stone bead of uncertain provenance, worn as part of a necklace or in a bracelet. 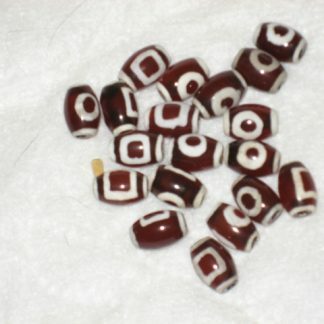 These beads are prized as protective amulets in many Asian cultures – including that of Tibet – and are considered to provide positive spiritual benefits. 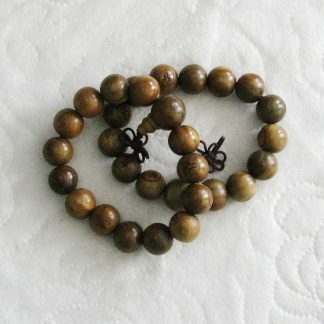 They are particularly favoured for the traditional 108-bead prayer rosary or mala. They have also been used in traditional Tibetan medicine. Beads used for this purpose will have small “dig marks”, where a portion of the bead has been scraped away to be ground into the medicine.